Provide comfort for the family of Aran Williams with a meaningful gesture of sympathy. 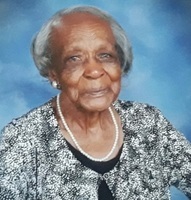 Mrs. Aran “Aikey” Williams, 108, of 209 Twin Falls Drive, Simpsonville, passed on Friday, February 8, 2019 at her home. She was a daughter of the late Sam “Bud” Johnson and Sarah Wilkin Johnson. Surviving: are twenty-one grandchildren; and a host of great-grandchildren; great-great-grandchildren; great-great-great-grandchildren; and other relatives and friends. We encourage you to share your most beloved memories of Aran here, so that the family and other loved ones can always see it. You can upload cherished photographs, or share your favorite stories, and can even comment on those shared by others. Grandma was one amazing woman with a heart of gold and loved her family and friends and was everyone's grandma my children and myself loved her and her husband they showed us love from day one ..R.I.H.GRANDMA A.WILLIAMS ..